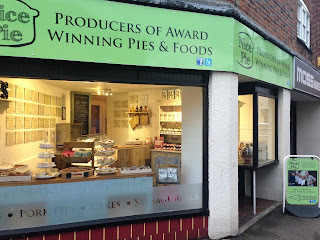 Nice Pie (Melton Mowbray) Pie Reviews and new shop! The incredible "Pierate Logo" pie made by Nice Pie! Whether you want to take a walk on the wild side or stick to something more typical in your pie, it seems with Nice Pie you're in for a nice pie treat! Below is the Nice Pie top 5, but they sell so many great pies that the top 5 doesn't even include all the Pierate Highly Recommended pies they sell, let alone mention the Pierate Recommended ones!!! Check out the full list of Nice Pies and find out a bit more about the company on our new Nice Pie Page! We're also delighted to hear that the pies have been selling so well that they have just opened up a new shop in the centre of Melton Mowbray itself (in addition to their current shop, which is part of the farm outside Old Dalby, north of Melton Mowbray). It's found at 55 Kings Street, Melton Mowbray. We look forward to visiting it when we're next in town! Nice to see you, to see you, Nice Pies! Pierate is the home of the Vegetarian Pie Review! The Pies and Lows of following Wycombe Wanderers!